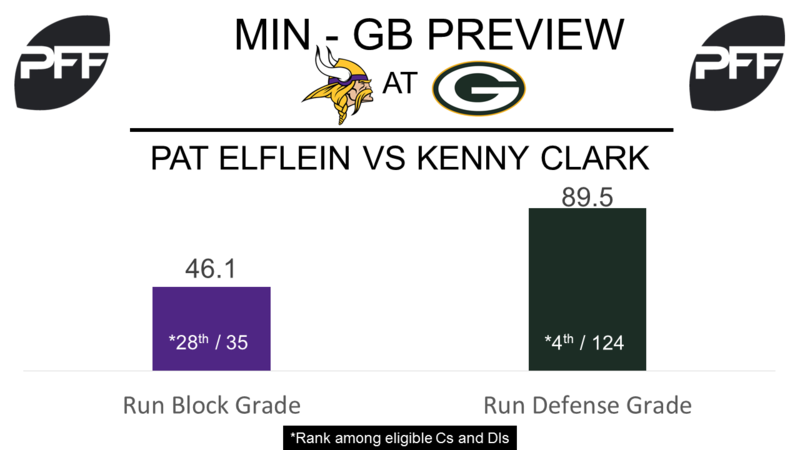 C Pat Elflein vs. DI Kenny Clark – Elflein has had a rough rookie season, he has graded poorly in both the pass (42.7) and run game (46.1). Both grades rank in the bottom 10 among centers. He has the third-lowest pass-blocking efficiency of any center in 2017 at 96.0, as he has allowed 23 total pressures on 456 pass-blocking snaps. His biggest challenge will come in the run game in this one, where he will face a top-10 run defender at his position in Clark. The former-UCLA product has had a breakout second year, ranking as the 12th-best interior defender with an overall grade of 88.5, but it’s his performance in the run game which has really impressed in 2017. Clark has the fourth-best run-defense grade among interior defenders at 89.5, and his 27 stops in run defense are the seventh-most at his position. RB Jerick McKinnon vs. LB Blake Martinez – McKinnon could have a big game in the passing game when matched up with Martinez. McKinnon has proved to be one of the better receiving running backs this season with a receiving grade of 84.0 (sixth). His 50 receptions so far this season are the 10th-most, he has also proved to be efficient running routes as he currently ranks sixth among running backs with 1.74 yards per route run. While Martinez has graded well in the run game, with a run-defense grade of 87.7, he has been susceptible in coverage. His coverage grade of 49.6 ranks 52nd among linebackers and he has allowed 84.9 percent of his targets to be caught while giving up three touchdowns coverage. WR Adam Thielen vs. CB Damarious Randall – Thielen continues to be one of the best receivers in the league. With an average of 2.44 yards per route run this season, Thielen is the fourth-most productive receiver in that category. He has also been great at helping his quarterback, with a passer rating of 105.3 when targeted. He will face off with one of the stingiest corners over the past month. Over the last four weeks, Randall has only allowed a passer rating of 34.3, the seventh-lowest mark during that time. He also ranks inside the top-10 for coverage snaps per target (9.6) and coverage snap per reception (20.4) during that same time span. RB Jamaal Williams vs. LB Anthony Barr – Williams ranks 34th among running backs with an overall grade of 73.5 and possesses an elusive rating of 30.8, while averaging 2.36 rushing yards after contact per attempt. Since Week 10, Williams’ averaged 1.65 receiving yards per route run, which ranks 13th among running backs during that span. Barr is tied for 13th among linebackers with a coverage grade of 81.7 and he’s allowed 0.97 receiving yards per coverage snap. Barr, however, has been less efficient against the run: he’s registered a run stop percentage of 4.4, which ranks 59th out of 62 qualified linebackers. T Jason Spriggs vs. Edge Danielle Hunter – Spriggs has allowed 17 total pressures since Week 11, which is the sixth-most among tackles during that span, good enough for a pass-blocking efficiency of 92.4. Additionally, his pass-blocking grade of 45.7 ranks 65th. Hunter’s pass-rushing productivity of 11.0 from the left side ranks 22nd among edge defenders and overall, he boasts an overall grade of 82.3. He forced six total pressures against Green Bay in Week 6. 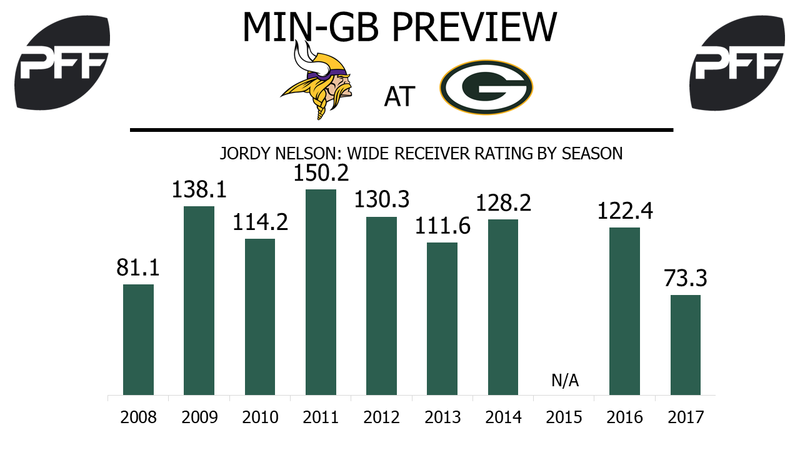 WR Jordy Nelson vs. CB Xavier Rhodes – With Davante Adams in concussion protocol, Nelson may very well be the one to draw the coverage of Rhodes. Nelson ranks 79th out of 85 qualified wide receivers with 0.96 receiving yards per route run and his overall grade of 77.3 is his lowest since 2010. In his last three games against the Vikings, Nelson has caught two of three targets against Rhodes for 18 yards. The former FSU-product ranks 29th among cornerbacks this year with a coverage grade of 82.6. He’s allowed 1.04 receiving yards per coverage snap and a 73.1 passer rating.